Fun for the Whole Family! An Exciting, Varied Repertoire. 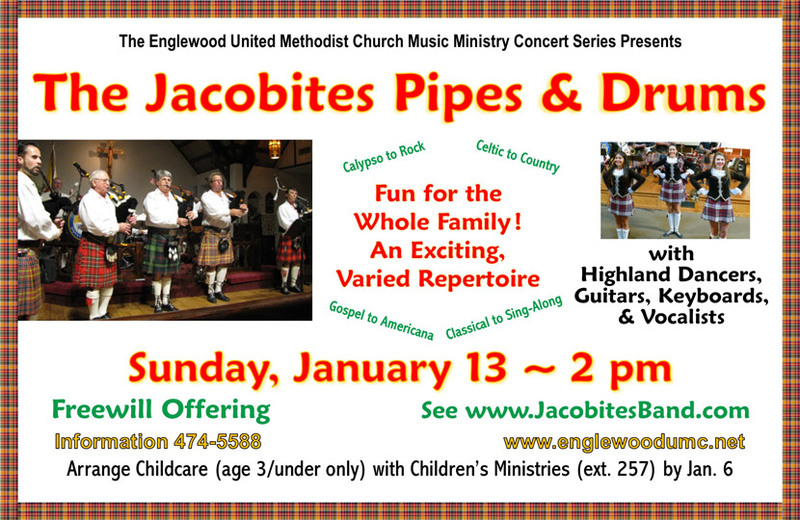 Bagpipes and drums are at the heart of this unique, fun-loving, and highly entertaining band. Also presenting the exciting and varied pieces are guitars, keyboard, vocals, and always-a-hit Irish/Highland dancers. The whole family will be delighted by eclectic selections ranging from Celtic to country, calypso to rock, gospel to Beethoven, and Americana to sing-along! Available for childen Age 3 & under only. Free at each concert. Except for Sunday worship services, pre-registration is required no late than 1 week prior to the event. Call 941.474.5588 ~ Ext 257. Or otherwise arrange with Children’s Ministries during office hours (Monday – Thursday: 8:30 am – 4:30 pm, Friday: 8:30 am – 1:00 pm) or on Sundays. Thank you for not taking lit screen & flash photos. Photos will become available on this website.